Growing up in Canada, we were often told that Canada became a nation when the Canadian Corps captured Vimy Ridge in April 1917 because it was the first time that all four Canadian divisions fought together during WWI. The Passchendaele Campaign (July-November 1917) would have been a more accurate choice since it was the first time that the Canadian Corps was commanded by a Canadian general, but the government downplayed the campaign because it had produced massive horrendous casualties, and a crisis over conscription was brewing. In fact, the Canadian involvement in the long, cold horror that was Passchendaele has received little attention in Canada. 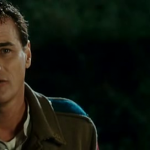 Until Paul Gross decided to make a movie based on his grandfather’s experiences in the campaign. Following the Battle of Vimy Ridge, Sergeant Michael Dunne (Paul Gross) is sent back to Canada, suffering from wounds, both physical and mental. Diagnosed with neurasthenia, more commonly known as shell-shock (what would be called PTSD today), he struggles to cope with daily life, suffering from nightmares in the day. Love with nurse Sarah Mann (Caroline Dhavemas) provides temporary solace, but he arranges to be sent back to the front to look after her younger brother David Mann (Joe Dinicol), who had enlisted despite severe asthma. Mann had enlisted after his girlfriend’s father, a doctor, had signed a medical certificate stating that his asthma was not a problem anymore, hoping to eliminate an undesirable suitor. 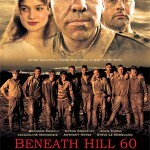 By coincidence, all of the main characters end up near each other at the front, on the eve of the Canadian Corps’ offensive against Passchendaele. Gross was motivated to make the movie because of his grandfather’s experience in WWI, particularly an incident where he bayoneted a young German soldier who was trying to surrender, which apparently haunted him for the rest of his life. The incident is portrayed at the beginning of the movie. 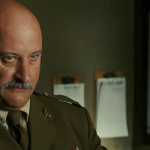 Having played a brave yet shy Mountie on Due South, Gross gives a good portrayal of a shell-shocked vet. Although Dunne explains that life is rough on the front, he is not really suffering from shell-shock, but guilt. After killing the young soldier in cold blood, admittedly angry after a young soldier with him had been accidentally shot by the Germans, he is given a medal for destroying a German machine-gun nest, and then goes AWOL because he can not deal with the guilt of killing a boy. Shipped back to Alberta, he learns that his mother had died from a broken heart, after receiving a telegram that he was missing in action, especially after his three brothers had all died in action. It is just a little too melodramatic, just a little. While the modest budget of twenty million dollars explains why there is only one battle scene, it is unfortunate that the script does not explain how many lives had been lost to gain incredibly insignificant amounts of territory. The entire background to a complex campaign that had lasted for months is limited to a brief comment from the battalion commander that the offensive has dragged on for three months, it has rained the entire time, the offensive has stalled, and now it is the Canadians’ turn. Stalled is a polite term for miserable failure. General Douglas Haig, commander of the British Expeditionary Force, had grandiose ambitions for the Passchendaele Offensive, which was intended to reach the Belgian coast to destroy the bases of the U-boats that were strangling England, and distract the Germans’ attention from the French Mutiny, which seemed unnecessary since the Germans had not actually noticed the mutiny. The Canadian Corps entered the offensive after it had chewed up two British armies and the Australian Corps without breaking through the German lines. This lack of depth seems especially strange since Gross has stated that he wanted to introduce young Canadians to their own history, rather than the American history that dominates Canadian movie theatres and television channels, but he failed, because he was too preoccupied with his grandfather’s story. The term vanity project is often used when describing failed movies, but it seems particularly applicable here. 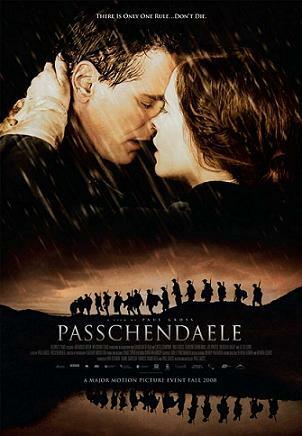 Although Passchendaele is a war movie, most of the story takes place in Alberta, presumably because the budget could only afford one battle sequence. Unfortunately, the scenes on the homefront just drag. In particular, a scene where a character shakes a morphine addiction in a single night, or possibly several hours, the time frame is not clear, seems to have been borrowed from an after-school special. Admittedly, there is some gorgeous outdoor scenery in Alberta during the courtship scene. The self-satisfied, pompous Major Bingham (Brian Jensen), commander of recruiting in Calgary, is excellent, in a loathsome way. Bingham had fought in the Boer War (1899-1902), and he does represent the typical thinking among many British generals, most of whom had gained experience in the Boer War, and refused to believe for far too long that WWI was a different kind of war. At one point, he declares that neurasthenia is the army’s polite term for cowardice. Bingham also typifies the powerful social pressure on young men to do their part for king and country, which eventually drives Mann to enlist. The script feels like a first draft, and apparently Gross was too busy with all of his other responsibilities to write a second draft. If he had found the time to produce a second draft, he probably would have noticed that much of the plot is a mess. While the nighttime encounter where Dunne threatens Major Bingham to ensure that he will sign an enlistment form for him is one of the better scenes in the movie, it seems unnecessary. Bingham was constantly criticizing Dunne as a coward, and would presumably have been happy to send him back to the front. The major catches up with Dunne the day before the offensive starts, so he gets to experience the war first-hand, but honestly it makes no sense. Bingham knew the name Dunne enlisted under, the battalion he joined, and knew the date of enlistment, but it still took three months to track him down. I realize that communication was slower back then since people had to use telegrams instead of email, but really…three months???? Basically, Gross wanted to put the major on the front lines to wipe the look of smug superiority off his face, and did not care whether it made any sense how he got there. To make the situation even more confusing Sarah had been discharged from the army because of her German heritage, but she is somehow able to re-enlist as a nurse in order to re-unite with Dunne. The script’s connection to reality weakens greatly in the last act. Mann, the guy that Dunne has risked his life to protect, is left alone for a few seconds, goes nuts, runs across the battlefield, gets captured and then is blown up by a freak artillery shell, leaving him crucified. So the fighting stops, and a wounded Dunne drags Mann back to friendly lines, in a scene which looks startlingly like Jesus Christ dragging his own cross. Just as he makes it back with Mann, the battalion shows up to save them. The Canadians had captured Passchendaele and David Mann had survived, so it should be a happy ending, but instead, there is a lot of crying, and a very weird ending. Aside from the strange, strange ending, the film’s main weakness is the supporting cast. I am sure that they did their best, but the supporting actors seem out of their depth. Canada had become Hollywood north by that time, but Gross does not seem to have taken advantage of the huge pool of talent that was available, or maybe the budget was too low. To be fair, Gross may not have worried about the acting ability of the supporting actors, since the main characters receive pretty much all of the screen time, other than a few token scenes with the other soldiers while they are waiting for the attack to start. 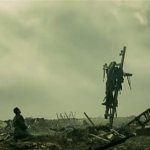 In the end, it is a love story set during war time, not a war movie with a love story as a sub-plot. Despite his good intentions, directing, writing and starring in a large-scale production was probably too much for Gross, who was unable to distance himself from his desire to tell his version of what he thought his grandfather wanted. Focusing on the personal story prevented him from actually telling the story of Passchendaele, rather than simply showing one of the many cold, bloody, pointless battles. 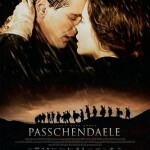 I really, really wanted to like Passchendaele. 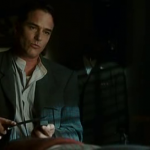 Canada has made almost no war movies, and none about WWI, unlike Australia, which has produced four or five WWI movies (I am losing count), and I always enjoyed Paul Gross on Due South. Even though my review turned out to be more negative than I expected when I started, I still think people should watch it, at least fans of WWI movies or Canadians interested in their history. Honestly, the movie is worth watching if only for the set design, which created a cold, muddy hell. 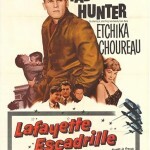 This is my entry in the O Canada Blogathon hosted by Silver Screenings and Speakeasy. Please visit the hosts’ pages to check out the other entries. It is the movie that everyone really wanted to like, but Gross’ grasp exceeded his reach. It is to be hoped that perhaps it will inspire other filmmakers to consider Canada and WWI as suitable material. I agree, the main problem seems to be that Gross just could not share some of the responsibility. I guess he was just too attached to the story. It is strange that the anniversary of WWI has not encouraged anyone in Canada to make another WWI-related film. I really, really wanted to like this film too, but I just couldn’t. It was such a disappointment, and it had such promise. However, it was still important that it was a rare Canadian war film (as you pointed out). Like Caftan Woman said, perhaps it will inspire others to tell this story again. Thanks for joining the O Canada blogathon with Passchendaele. Disappointment seems to be the common reaction to the film, even though there is no denying that it is an important subject. I was hoping that the anniversary of WWI would spark interest in another look at WWI but no such luck so far. Thank you for hosting the blogathon, I have found a lot of interesting posts. That is Major Dobson-Hughes man not Major Bingham!